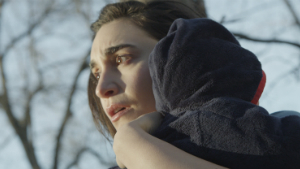 Filmmaker Shoshana Rosenbaum chats to Stranger With My Face about motherhood in horror, her plans for the future and of course, her film screening as part of Short Films Program on 14 April. The Goblin Baby is your directorial debut; can you tell me a little bit about the film? It’s a supernatural thriller about the first year of motherhood. It’s a modern take on the age-old changeling tale. I’ve always been interested in stories about changelings – where do they come from? Why would a mother suddenly not recognize a child as her own? And what would this story look like in the modern age, with our understanding of postpartum depression? Some people interpret the events in the film as supernatural, as the protagonist does, while others see it as a psychological experience. The anxieties of motherhood are a reoccurring theme in horror, from Rosemary’s Baby and more recently The Babadook, why do you think this is? I think creating and being responsible for another life is one of the greatest of human experiences – and potentially the most terrifying. The only reason motherhood hasn’t been explored more in film – in horror as well as other genres – is because movies are mostly made by men. A large amount of your cast and crew for The Goblin Baby were female, was this important to you given the content of the film? Absolutely. Two of the three co-producers were women (and moms), and the fourth, who was also our Director of Photography, was a man (and a dad) who was totally on board with the story. Much of our cast and crew were female, and many people in the cast and crew were parents. There are some difficult moments in the film, and it was enormously helpful to have people who got the story in a deep way creating it together. As a first time director, what challenges did you face? It was my first time going through the process, so everything was new to me, including crowdfunding. Our five shooting days were spread over a five-week period, working around everyone’s day jobs (including my husband’s, who watched our three kids while I was on set.) 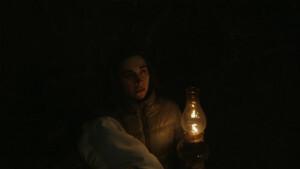 We shot during a very cold winter, sometimes late at night in the forest, with a real four-month-old baby! But we had a great group of people involved, and overall it was exhilarating. Your script for The Goblin Baby earned you a place as a finalist in the DC Shorts Film Festival screenplay comp. This allows you select and direct actors and have your screenplay performed live on stage. Sounds like an incredible experience! After seeing The Goblin Baby performed, was that your main inspiration to go and make a short film? Yes, DC Shorts was a huge leg up to actually making the film. I had been writing features that weren’t getting produced, and since I had an interest in directing and producing as well as writing, I decided to write a low-budget short that I could make myself, locally. Working with the actors while preparing for the DC Shorts table reading gave me confidence that actors would respond to the material. So many people in the audience came up afterwards and told me they could see it being a movie, so I decided to go for it. What are your plans for the future? Can we expect more shorts, or do you have a feature in the works? I have a short called Hide and Seek that’s a finalist in the DC Asian Pacific American Film Festival Script to Screen competition; it will have a staged reading there on April 22. It’s a Twilight-Zone-y story about a stay-at-home-dad with mixed feelings about leaving behind his old life as a rock musician. I also have a family feature script called The Creepy House, about a group of girls who befriend the ghost of a girl and have to fight to keep her haunted house from being torn down. It’s in WIFV-DC’s Spotlight on Screenwriters catalogue and is making the rounds to producers. Finally, I’ve written a feature-length expansion of The Goblin Baby called The Goblin Child, which extends the story to involve a little neighbour boy who might be a changeling himself, and a babysitter with questionable intentions. I’m really excited to work on the pitch for it at Stranger With My Face’s Attic Lab. THE GOBLIN BABY screens at The Peacock Theatre on Thursday, 14th April from 8pm, as part of the Shorts Program (+ Opening Night Party). Tickets $22/$18 or use festival pass. 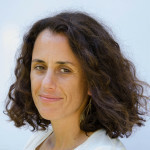 Shoshana Rosenbaum will be present for a Q&A.